I haven't had much success with making macarons in the past. The first time I tried making them, they crumbled and I was so discouraged, so I wanted to try again with a new recipe. 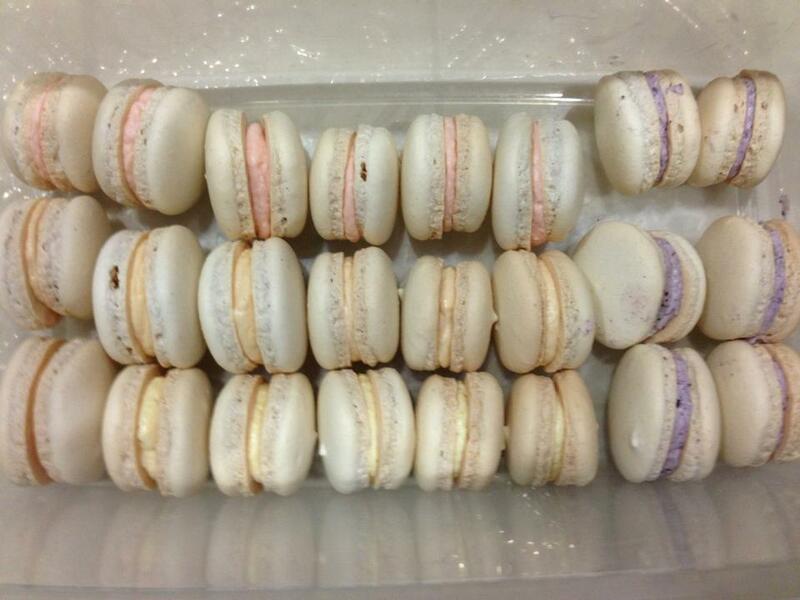 I made the vanilla macarons as a test batch before tackling the hazelnut ones. First I made the french buttercream. It was different than the buttercream we had made previously. This version had cooked egg yolks and sugar, instead of egg whites. I used plugra butter, and man, it was buttery! It tasted like pure butter, even after I added the vanilla bean. The next day I made the macaron shells. These were much simpler than expected. I used more of my homemade almond flour, and substituted a little bit of vanilla sugar for the regular sugar. The batter was easy and seemed foolproof. After baking, the shells seemed quite tall, but they settled down after a few minutes of cooling and developed the little "foot" that is the signature of a good macaron. I re-whipped the buttercream and piped it on half the shells. When sandwiching the halves together, they cracked slightly. Overall, I was very pleased with the outcome, although I could use some more practice. The shells were delicious on their own, I could have eaten a dozen! The filling was a bit too rich in my opinion, I would have preferred a lighter buttercream. I still need some work making them look pretty. After making the vanilla version, I bought some macarons from Tout Sweet, and they were so pretty and flat and perfect, so I strived to make mine look perfect. When I made the hazelnut version, I had the technique down already, so I was confident. I need more practice piping, as mine seemed less refined. The filling for this was a ganache, using caramelia chocolate, which is a milk chocolate with a slight caramel flavor. It was delicious! So while the taste was great, I'd like to work on presentation in the future. Overall, not a difficult recipe, and very delicious. PS- this was the first recipe in the book that required NO BUTTER! Well, now I know what it takes to make macarons. Surprisingly, it wasn't the most difficult cookie we have done. I think it's one of those cookies that you just have to make over and over, and you will get really good with practice. 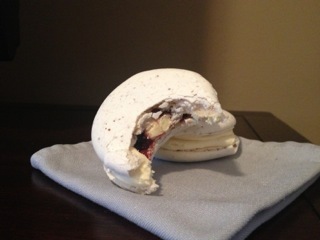 I opted for the vanilla macaron. Butter cream was pretty easy. I made this ahead of time, I think 2 days ahead. I re-whipped with vanilla seed just before filing macarons. No surprises at all. I'm actually quite good at butter creams now. Once again, I have a large surplus of butter cream. Almond flour I always have on hand, fresh from Alfieri Farms. I pulsed it through the food processor, but think it was still not fine enough. It would not sift through the fine mesh along with the powder sugar. I still tried to push it through with a rubber spatula, but dint want to pass. So, I whisked it all together, and finished with egg white. Making the other part was actually pretty straight forward. No surprises. I love my Copper Core 2qt sauce pan for boiling sugar. It really brings it to temp quickly, and also with the rolled lip, it is really easy to stream into the mixer. Piped the batter out. I didn't make the circles ahead of time. Fail #1.... I put both cookie sheets in the oven at 350. I did not read the recipe all the way through the baking. The important part was to lower the oven to 325. Oops. You can tell what happened. They cooked too fast, and cracked. Bummer. Pic included. The other batch, I did correctly, and they came out great. Assembling the cookie. They are pretty fragile things. I was pressing the two halves together, and had to be super careful. I put in the freezer as instructed, and will pull out tomorrow. I did taste several of the cracked ones, and used them as chips for by butter cream dip. They are pretty good. Glad I made them. Unlikely I will make again. I really appreciate though the good folks around town who make these every day by hand. It really is an art form, and I have a greater appreciation for macarons. I was a bit intimidated to make these cookies. They contained buttercream which I failed to make twice before. I decided to tackle the vanilla and the lemon macarons. The vanilla macarons were very easy to make. I followed every step carefully. Cooking the syrup for the meringue gave me the confidence to make the French buttercream. I got nice ribbons as I stirred in the meringue to the flour mixture. I piped the mixture on the the prepared parchment paper with ease then baked as directed but the macarons came out a little too dark. I shortened the time on the next batch and they turned out perfect. I made the French buttercream and pipped it on the the cookies. I didn't make this cookie with the bullseye filling. The cookie is crunchie on the outside and completely chewing on the inside. The buttercream is delightful. I also made the lemon macarons. I read the instructions over and over and managed to skip two steps when making the basic buttercream. The meringue was perfect and the timing on the baking just right. When it came to making the basic buttercream, I forgot to refer back to the actual recipe and left out the Lemon Curd. I also forgot to add the 33 grams of sugar in the bowl of the stand mixer while beating the egg whites. I added the sugar after I creamed the butter and the buttercream came out gritty. I piped the buttercream on and froze the macarons. I can say they are tasty even without the lemon flavor. I did make a few of the macarons with the bulls-eye filling using the lemon curd. They are also crunchy on the outside and chewy. The ones with the bulls eyes filling are quite tangy. The first batch I made seemed quite stiff and I incorporated just a little bit extra egg white. The recipe says you might not need all of the meringue mixture but I had used it all as well. Since I made the raspberry version with raspberry buttercream and raspberry jam bulls eyes I incorporated a few drops of burgundy colouring into my meringue. I made it a bit dark since it would be diluted by the egg white, almond, sugar mixture. The sheet pan at the highest position in the oven yielded the best results. Likely the hot air higher up helped to form the shell more quickly - and prevent cracks - than those on lower racks as well as produce more significant feet. The batter was just thick enough to not lose the uniform round shape I piped and also thin enough for the tips to slowly disappear. I estimate that about 30% of my first batch and 40% of my second batch had some cracking appear. All in all I was able to make about 30 finished macarons. This is a really great recipe. It requires that you cook the sugar syrup and add that to the egg whites. This cooked meringue is much more stable and when added to the dry ingredients, the batter is much thicker than any I've made in the past. Then you can mix longer to loosen it to the right consistency. Second, a cooked meringue is drier so the macarons don't need to sit to form a skin before baking. As much as I praise the recipe, I need to work with the placement in my oven because the first batch of shells cracked. Also while I got the desired macaron feet, they didn't rise all the way. It's like they stopped and then kind of deflated so the feet were smashed. For the filling, I added 1/2 cup seedless raspberry jam to the buttercream because I wanted a stronger flavor. Overall, the recipe is worth another shot. I decided to make the vanilla version, but I used raspberry jam as my filler. They turned out really well! Knowing that macarons can be quite finicky, I was concerned that they wouldn't come out quite right. The recipe was very clear and they came out great! I was thrilled to see the "feet" on the base of the cookie - the mark of a good macaron! I used a convection oven and the smell was amazing as they were baking. I am going to freeze a few to see how much that improves them. The rest I am going to leave as is for a few friends coming over in the morning. I'm sure they will enjoy them thoroughly just as they are! 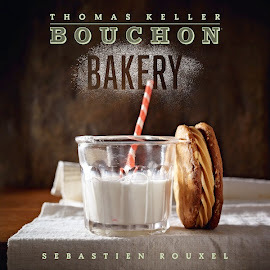 Another winner from the Bouchon Bakery Book!! After seeing you blog for making Bouchon Bakery's macarons, we we're inspired to try and make some too. 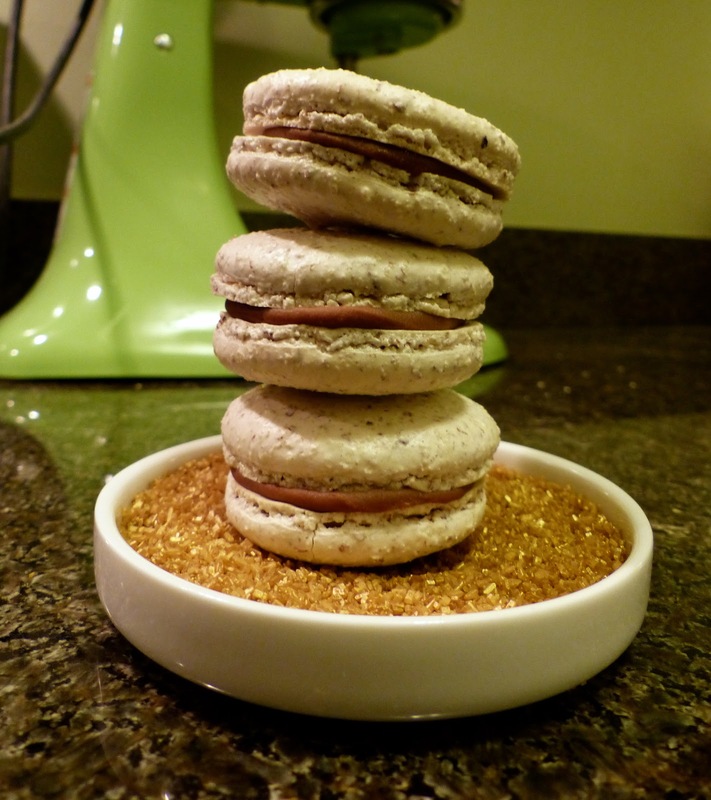 We made a half batch of the Vanilla Macaron recipe, only because we were not sure if it was going to be a flop. Not bad for our first try, they came out with a nice pied. Being they were vanilla, we colored our buttercream. Thank you for the inspiration! I used the buttercream base from the better nutters and added 1 tbs of seedless raspberry jam. I baked, cooled, filled, individually wrapped in plastic, froze, refrigerator defrosted, then room temped this baby and now I'm finally going to try it. Results: great crisp top. Chewy inside. Nice almond meal texture. Despite having issues (syrup going solid, having to use a scoop because my pastry tip wasn't big enough). I think they turned out with good flavor. A little sweet but not cloyingly so. I cooked these in a convection oven on parchment for the minimum baking time plus about 1 min to get a tiny bit if color on the tops.